A man is not apt to forget the instant he becomes a killer; that one fateful instant when he takes another’s life. It would not matter that Jack Granger has killed, all soldiers train to kill, except that he is the Democratic nominee in the presidential election of 2020. Having secured the nomination as Governor of Missouri and on the strength of his M-16 Agenda, his political platform developed in the killing sands of Iraq, Jack is days away from the White House when the situation in Iraq and in Washington D.C. changes everything. Now it is a race against time, and his own past, as he makes a last ditch effort to save his bid for the presidency, and possibly the world. 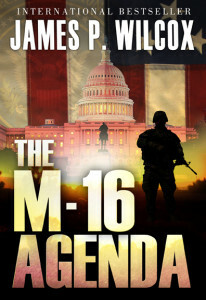 From the war torn battlegrounds of Iraq to the halls of power in Washington D.C., M-16 Agenda follows one man’s rise to the heights of political power, as he struggles to live up to the promises he made to his fellow soldiers, his family, and himself.